If you’re an iPhone user and you love music you have a huge combination of music apps to choose from to customise your device to get all the features you want. Several of these apps are frequently top rated by users. Here is a brief review of the top Apps, please do have a read about each one and then let us know if you have already tried them, if you have not then please search the App Store, download then and then send us your mini reviews. Last.fm is a social site for music lovers which lets people share their favourite tunes within the community. You can buy tracks from iTunes, get recommendations based on your preferences, build a playlist, tag tracks and share them with Last.fm members. Great if you’re really into your music and the buzz that goes with it. Pandora lets you create a personalised radio station that only plays songs and artists that you’ve chosen. You can also get more info on an artist or album, and share your station with friends. Shazam is a popular free app, which identifies songs for you when you place your mobile phone next to speakers when it’s playing. You’ll never be left humming a tune you don’t know the name of ever again. If a big part of the fun for you is to sing along to your music, or you simply just want to know what the words are then the Lyrical free app can help you out. If you’re playing a song it can find the lyrics for it or you can search separately by artist, song title or a few lines from it. For even more than lyrics there’s also the TuneWiki free app. Once you’ve got your words you can find out what folks worldwide are listening to and also get a real-time worldwide Top 50 chart, so you’ll be right up to date with what’s ‘hot’ in the music world. Rhapsody provides you unlimited access to 11 million songs where you can find your favorite songs without any hindrance at all. Rhapsody is not only for online listening but the outstanding feature provided by Rhapsody is offline listening. Daytrotter is designed to share music via Facebook and Twitter and streams music over Wi-Fi and 3G.It is extraordinary app for listening the music of your choice. NPR app is brilliant for discovering new music on your phone especially the rock music. You can find any new song in the rock category along with interview with music celebrities, reviews and song concerts. 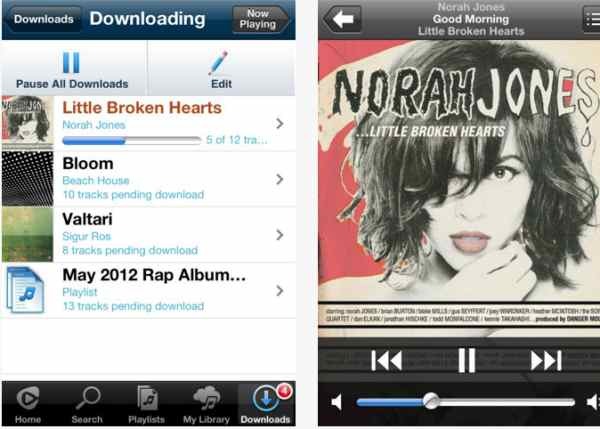 Songza is based on the ideas coming from Pandora and application of those ideas into new one. Songza gives you a choice to match the songs or music with daytime, your mood and activities. So the app is customized with your mood and preferences and provides you with what you really want. There are many more and most are free, so why not try a few out to see how you like them.